Once a decision has been made to engage a landscape contractor, a potential client sets about finding the right one to do the job. It does not matter if it is a garden design, full landscape or a gardening maintenance contract that is being planned, there is a need the right person or company to do the work. 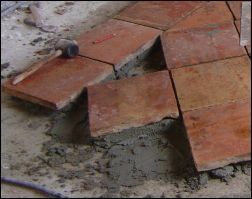 If you are one of the contractors who gets the call - what crietia do you set to decide if the client is right for you? Speaking from a contractors point of view, it can be a pretty tough position to be in when you first arrive at a client's property. The client, whilst more than likely polite, will often be tense and sometimes standoffish. After all, they are about to embark on a process that will more than likely result in them committing to hundreds, if not thousands, of pounds of their money to a project that has not been designed or built as yet, and they are desperate to get the process right. It is a very understandable psychology and one that we all experience, consciously and subconsciously, as a consumer. I have had some very tough grilling by potential clients and on occasions some pretty unpleasant experiences. Whilst the majority of clients are balanced and rational in making their choice, others are defensive, rude and sometimes nasty. It is as though they need to be in control of you and I do not exaggerate when I say, once they sign on the dotted line, clients' personalities can change, making it feel like a 'them and us' situation - some clients demand more than a pound of flesh. Once you have considered the above scenario, also consider the opposite and imagine the client being under scrutiny too? I bet that there are not many consumers who have considered the possibility that they are the ones on trial at the initial meeting and what is said and done at the first meeting could result in the whole process going pear shaped or not even going ahead as the contractor makes a judgement call based on the profile of the client as the meeting progresses? The contractor should isolate his feelings and the desire to win the work and concentrate on the personality of the potential client from the outset. If the client has done their due diligence, one can feel flattered that they have chosen you to bid for their work but, if the client is sensible, they will have asked at least three contractors along to a meeting - it is not taboo for a contractor to ask who they are pitching against. The client, whilst perhaps initially suspicious of motives, has no real reason to hold any information back. After all, it is of a mutual interest that any project is conducted as smoothly as possible, so hiding information or trickery should not part of the game. It is also important that the client has invited estimates from three (or more) evenly matched contractors. It is not inconceivable that a one man band, with less than five years experience behind them, will give a great service at a reasonable cost, but, if the size of the job dictates a strong organisation with a multi-level skill set - and access to and experiences of a range of heavy equipment - it would not be wise in entering any kind of auction when it comes to bartering for services. There is a very rife black market in the gardening and landscaping industry but any any contractor worth their salt will resist the tempation, if offered, to take cash with a view to avoid paying tax. Clients should always be issued with an estimate or quote and always, always give a receipt (especially if the client does pay some or all of the balance in cash). The most important message about this post, if you are a contractor, is be prepared to walk away if you do not feel the conditions are right for you. Your reputation and your profitability should mean more to you in the long run. A bad experience with the wrong client can lead to much heartache. It might seem unprofessional to decline giving a price but I assure you, contractors are more likely to be respected for their resolve and integrity for being selective. Sending a letter to decline any invitation to tender a price will ensure that the contractors reputation stays intact. There does not have to be a reason and it is not necessary to enter into any kind of convoluted exchange after the event. The client may well be disappointed with this decision but if the vibes are not right then it is better to walk away. Great comments once again. We've had a number of problem clients in the past and are now choosing our clients more carefully and are confirming project guidelines right from the start.